Dynamic copyright or layer credit in QGIS 3.4? Is it possible to add a layer credit to the bottom right corner of the map and print composer in QGIS 3.4? This fuctionality existed in 2.8, as seen here. I can't find this option in the layer properties anymore. I realize I can do something similar manually via the Copyright Decoration, but it was nice to just check/uncheck a box when needed. The Copyright Decoration is also always on top and visible. Perhaps someone can suggest an expression to use in the Copyright Decoration that will pull the visible layer's metadata and use that as the text string? My QGIS expression skills aren't that strong yet. Building on J. Monticolo's excellent answer, here's a method that gives attributions for all visible layers. Add or subtract lines so there's one for every layer in your project. When the expression is evaluated, it only applies to visible layers. By creating sure you have a line for every map layer, you cover every possible combination of enabled/disabled layers. 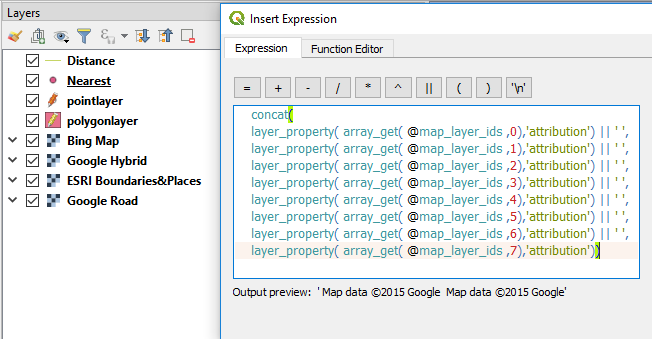 Note that the array is 0 indexed, so the first map layer has the index value 0, and the last map layer has the index value (total number of layers) - 1. You can change the separator between attributions. For example, to use a semicolon, substitute ';' for ' '. Layers without any attribution are omitted automatically. If you see extra spaces in the attribution as displayed on the map, check if any of the layers have a space in their attribution field. In QGIS 3.x, go to the View menu > Decorations > Copyright Label. Why is there a shift between OpenLayers and vector layer in print? QGIS 3.4 : Add points to exact locations?